I recently received my first braced suit. That is, one designed to be worn with braces, featuring a high waist and fish-tail back. When I first wore the suit it seemed that the front two pairs of buttons were a little too far round to the side. They were more on my hip than under my stomach, with the consequence that the braces felt like they would fall off my shoulder constantly. But then I’ve never worn braces before, so I didn’t know whether that was normal. After a day viewing collections, and so trying on quite a few suits, I decided something had to be wrong. Every time I took off my jacket one or the other of the braces would slip off and have to be re-hung. Not exactly elegant. Returning to my tailor, he explained that there were two standard settings for the buttons position. One, most often used in the military, is to have the rear of the two buttons sitting on the side seam of the trousers. This ensures that seam, often decorated on military dress trousers and so a point of focus, stays taut and straight. The second is to have the foremost of the two buttons sitting on the crease in the front of the trousers, keeping that taut at the slight expense of the side seam. This is required on pleated trousers, where the way that the pleats hang is key. On flat-fronted trousers it matters less, especially as few men these days bother to maintain the crease. On both options the distance between the buttons in a pair is the same. And as it is the rear button that sits on the side seam in one option and the front button that secures the pleat in the other, the difference between the two positions is not great. But it is noticeable. The other advantage of the first position is that the braces cannot be seen when a man’s jacket is open. Unless he has his hands in his pockets and pushes the foreparts way back, the braces remain hidden. It was for this reason that my tailor went with the first position, as I had never worn braces before and seemed a little self-conscious about it. He forgot to ask me what I preferred, though, or to take into account my sloping shoulders. The latter means my braces need a little more purchase than the average man. So the buttons were moved. And now I know the next time I order a braced suit. You can follow the discussion on Where the brace buttons should be by entering your email address in the box below. You will then receive an email every time a new comment is added. These will also contain a link to a page where you can stop the alerts, and remove all of your related data from the site. Make sure that the tabs on the braces hit just below the rib cage in that hollow before your hipbone. You’re taller than I so you may not need to have them shortened as I do. Thanks, good advice. I do still find they are a little too long, but then I guess that’s the industry default – few people notice if they’re too long, everyone notices if they’re too short. Hi Simon,I am huge fan of your work,the knowledge you have about clothes and apparels are just tremendous. There are few questions which triggers me every time I think about suspenders. 1.Can it be worn with the trousers which have loops for belt. 2.Can suspenders worn with double breasted suits or will it look good with them. 3.Is there any specific reasons or meaning or difference with suspenders with button or with loops. 4.Does its colour has to be matched with other accessories of the attire. 3 not quite sure what you mean – to fasten to the trousers? Thank you Mr.Crompton for your reply. What is the distance mentioned in the article in regard to the spacing between the buttons on the fastenings for the braces? Can this be altered for personal preference or should the measurements be strictly adhered to? Does this distance have to be the same for the front and rear fastenings? Visually, with flat fronted trousers, should the braces just ‘hang’ straight down? I wouldn’t worry about the spacing of the brace buttons. If they’re very close or very far apart, they will lose function, but only at those extremes. Anything you like or your tailor recommends is fine. It can also be different front and rear. And yes, ideally the braces should create a vertical line, but again the emphasis is on functionality. So if that’s difficult because of your body shape, don’t worry about it. Hi Simon – I have just had a pair of trousers made to be worn with braces – my first. They are a nice dark grey and I want to get a couple of pairs of braces to wear with them. 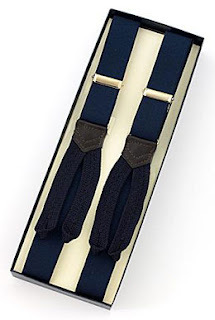 I want the colours of the braces to be nice and basic – navy blue and darkish grey initially, but I was wondering about moire braces and whether you think it’s acceptable to wear these (in a navy blue or dark grey) during the day with my trousers and jackets/blazers? I have a white pair of moire braces I wear with my evening suit, but wondered if moire should only be worn at night and are too dressy for daytime use? Many thanks! Hi Simon, I wear braces almost exclusively, so this article was of great help to me. I only want to disagree when it comes to braces sliding off the shoulders: in my experience this is due to an intersection placed too low on the back, ideally it should be positioned top between the shoulder blades. Would you position the foremost button over the crease or the pleat of pleated pants? Of course. And on double-pleated pants? I feel I have to bring this guy to your and your readers attention. https://papilionaceous.com Makes silk ribbon for Albert Thurston. I had never heard of him before seeing a post on Instagram about a custom fabric order. I spoke to him earlier and he seemed a great guy to speak to. Please check him out even if it’s just for his fabric as I know you don’t like to wear braces and he makes fabric for other companies aside from Thurstons. I have absolutely no affiliation with him even though it sounds like I’m desperately trying to sell him to you.